The links and information provided on this page do not reflect the opinions or views of the Valdosta-Lowndes County Chamber of Commerce. The information is to be used for informational purposes only. 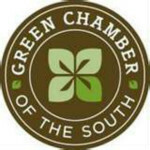 The Valdosta-Lowndes County Chamber of Commerce has partnered with The Green Chamber of the South to provide Chamber members access to many resources and information pertaining to Environmental Technology. Through this partnership, the Chamber can facilitate the growth and promotion of sustainable businesses in Metro Valdosta by providing opportunities for networking, education, business development and collaboration in the ET sector.